Peter Pletcher and NLF Shakespeare’s Rhythm earned the High Performance Working Hunter Reserve Championship during WEF IX. Photo By: Emily Riden/PMG. Wellington, FL – March 13, 2013 – Nordic Lights Farm was once again at the top of the standings during the ninth week of the prestigious Winter Equestrian Festival. Peter Pletcher kicked things off with the reserve championship award during the High Performance Working Hunters aboard NLF Shakespeare’s Rhythm. Eirin Bruheim then showcased her new mounts NLF Newsflash and NLF Billy On Show in the Medium Amateur-Owner Jumpers. Lauren Hough concluded the week by qualifying for the jump-off during the $82,000 Suncast 1.50m Jumper Classic with Tackeray, and eventually placed eighth. Pletcher and NLF Shakespeare’s Rhythm have earned leading hunter awards at the nation’s top events, and Week Nine of the Winter Equestrian Festival proved to be no exception. Competing in the Gold Coast Feed High Performance Working Hunters, they picked up a second and third place ribbon over fences, as well as second place ribbon in the stake class and a fourth place ribbon in the handy class. Their efforts in the ring were honored with the division’s reserve championship tricolor. Eirin Bruheim and her newest mount NLF Newsflash made their competition debut this week in the Medium Amateur-Owner Jumpers. Competing in the speed class, they jumped each fence without fault and raced through the timers in 67.317 seconds to claim the third place award. Bruheim also competed with NLF Billy on Show in the Medium Amateur-Owner Jumpers. The pair produced a double clear effort, completing the jump-off in 37.349 seconds for the sixth place honors. Bruheim and her veteran ride NLF Trans Atlantic represented Nordic Lights Farm in the Low Amateur-Owner Jumpers, where they were also double clear for the seventh place ribbon. Olympian Lauren Hough wrapped up the weekend for Nordic Lights Farm riding Tackeray in the $82,000 Suncast 1.50m Jumper Classic. The pair was clear over Steve Stephen’s technical first round track to advance to the tiebreaker. They incurred eight faults during the speed round, which was good enough for the eighth place prize. 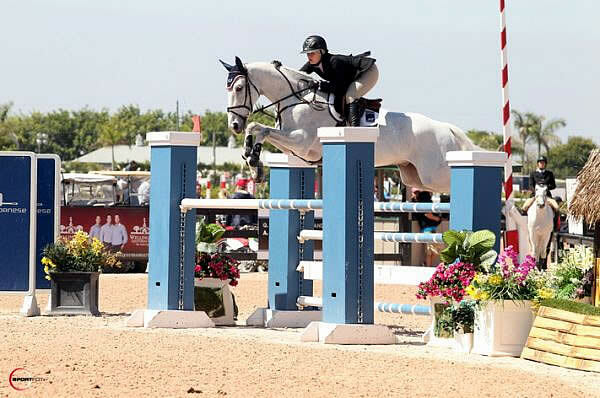 Nordic Lights Farm will continue showing at the prestigious Winter Equestrian Festival in Wellington, FL. Bruheim and Hough will compete in the jumper divisions with their talented mounts, and Pletcher will return to the derby ring with NLF Shakespeare’s Rhythm later in the season. Nordic Lights Farm is a 70-acre establishment located in Tomball, TX, that was founded in 2007 by the Bruheim family to help further the equestrian goals of 20-year-old Eirin Bruheim and 18-year-old Lene Bruheim. Both girls have worked their way up through the ranks and are currently competing at the top levels in the hunter and jumper divisions aboard their incredible string of horses.